Radio-controlled tanks that fire actual BBs? Glass sliding doors beware. These RC tanks, which I don't even know how they're allowed really in this day and age but I'm glad they are, are modeled after some of the most iconic tanks utilized in our most iconic wars. Utilizing airsoft tech and loaded with 6mm BBs for ammunition, these RC Battle Tanks are all equipped with simulated engine and cannon sounds and actual recoil action when the cannon is fired. The tanks come pre-assembled and vary in sizes, quality and price. There is a tank to fit all budgets...and risk tolerances. Generally, the basic entry level versions of these RC tanks are only 1/24 scale while the upgraded versions come in a 1/16 scale size with full metal gears and tracks along with a more mobile turret in terms of turning angle and vertical function. They also have a longer cannon range. And of course a higher price. All models come with a hardened plastic body panel construction, an authentic engine sound, machine-gun sound and recoil when fired. We've tried to list both versions where applicable. This is a 1/24 scale replica of the M1A2 Abrams USA main battle tank. The M1A2 has been in service since 1980 to the present. It first saw action in the Persian Gulf War. This replica has a maximum firing range of 9 feet and a control range of 30 feet. Battery time is around 20 minutes and it comes ready to run with a 300 degree rotating turret and 20 degrees of vertical turning angle. The M1A2 has realistic firing sounds and recoil action when cannons fire. A 1/16 scale upgraded version of the M1 Abrams Tank is also available for $159.99. This is a 1/24 scale replica. The 1/16 scale upgraded version comes with metal gears and tracks and is also available for $189.99. You might recognize the M4A3 Sherman tank from Sargent Wardaddy and the classic WWII movie Fury. Nicknamed as the "Easy-Eight" or "E8", this tank is a quicker, slightly better armored version of the M4 Sherman. This model is a 1:20 scale with 180 degree rotating turret with 15 degrees of up and down movement. The M4A3 fires 6mm BB pellets up to 9 feet. This is the entry level version RC battle tank. An upgraded and larger version is also available for $139.99. This 1/16 scale replica has a powerful motor airsoft gun with firing range of up to 75 feet and a control range of up to 60 feet. The battery will get you 60 minutes of mayhem. The German Tiger II tank had a short lived deployment during WW II from 1944-1945. It is also known under the informal name Konigstiger often incorrectly translated as King Tiger. We'll go with the incorrect translation! This model is a 1/16 scale version with a 320 degree turret revolution range and 35 degrees of vertical tilt. It has the upgraded metal gears and tracks and a maximum climbing gradient of 35 degrees. The Leopard 2 is a main battle tank for the West German Army. 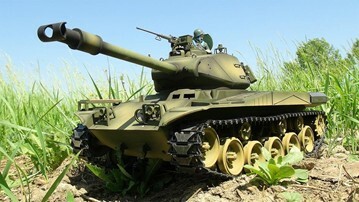 The tank first entered service in 1979 and is still in production. This is an upgraded 1/16 scale model with metal gears and tracks. The M26 Pershing was a heavy tank/medium tank used by the United States Army. The tank was named after General John J. Pershing, who led the American Expeditionary Force in Europe in World War I. It was briefly used in the final months of World War II during the Invasion of Germany and extensively during the Korean War. This is a serious collector's mode tank which is reflected in the price. Some of the many features of this M26 Pershing replica include, a realistic smoking exhaust, authentic engine start up and shut down, machine gun, & cannon fire sound effects. A 2.4GHZ radio transmitter, enables seamless battles between two or more tanks with no Interference. The 1/16 scale model M26 has heavy duty caterpillar tracks and an independent suspension system. The main cannon can shoot Airsoft BB's up to 82 feet. The Kliment Voroshilov (KV) tanks were a series of heavy tanks deployed by the Soviet Union and named after the Soviet defence commissar and politician Kliment Voroshilov. The Red Army used the KV-1 during World War II. The KV series were known for their heavy armour protection during the early part of the war, especially during the first year of the German invasion of the Soviet Union. This KV-1 replica is a collector's quality 1/16 scale model with all of the bells and whistles expected at this price level for an RC Airsoft Battle Tank.